Yellowback seabream or kidai in Japanese is porgy-like fish that can be found all throughout Southeast Asia including Japan. It is known to have countless many names. It is commonly eaten with rice cooked in kombu dashi soup base. The calories in Yellowback Seabream per 120g(1fish small edible part) is 130 calories. 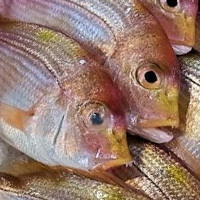 Yellowback Seabream is calculated to be 108Cal per 100 grams making 80Cal equivalent to 74.07g with 22.32g of mostly protein、3.72g of fat、0.24g of carbohydrates in 120g while being rich in vitamins and minerals such as Vitamin B12 and Vitamin D.